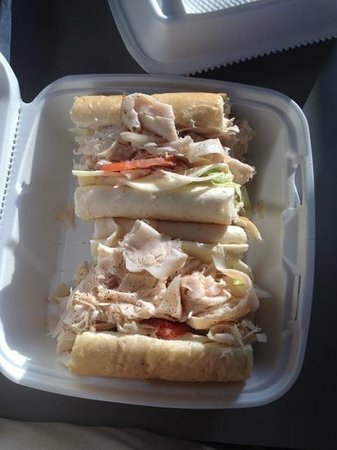 Try the Big Bertha size sandwich of any type and you will have enough food for three persons. And they have homemade deserts and hard Ice Cream. Food is pricey for your basic sandwiches, and burgers. It was just okay. Will not be going back. Boring. If ordering a sub....make sure you have someone to share it with! There is no lack of meat on their subs. their ham and cheese sandwiches are alright ! But their fries were disgusting! Their chicken is good too but you can judge for yourself! Went here to play mini gold with family and went inside to the grill for lunch. Oh my...great sandwiches. We ordered the 17" ones and cut them in 3 sections that's how large they are. And they are just filled. A nice place to stop by after a round of mini golf. Nothing fancy, but it's all good. They give a ton of fries! Nice outdoor seating area. I love their chicken cheesesteak. If I get the Big Bertha, I can have 4 meals out of it! Great place to relax after a round of mini golf and grab some ice cream too. Get quick answers from Big Bertha's Grill staff and past visitors.